Kierkegaard grew up with the tyranny of his father's severe and gloomy religious obsessions. His mother and five siblings died in quick succession. The meaning his father gave to his misfortune and grief was that because he had once cursed God, and God was cursing him back. Learning of his beloved father's curse was a "great earthquake" in Kierkegaard's life. He described his horror and dread as "the stillness of death spreading over me" (Kierkegaard 1958, p. 39). Kierkegaard proposed marriage to Regina Olsen, whom he deeply loved, but broke off the relationship, a confounding event that was extremely significant to the rest of his life. His writing was greatly influenced by mourning this sacrifice. During the two years following the end of his betrothal in 1841, he wrote Either/Or, Three Edifying Discourses, Fear and Trembling, and Repetition. Kierkegaard's writings are full of references and innuendoes that indicate how he had internalized this relationship and the breakup as a narrative imbued with powerful affect that is an integral part of his philosophical thinking. He also internalized his relationship with his father this way. While his journals and some other writings suggest subjective meanings of his life, he said that after his death no one would find in them a clue to his truth. His inwardness was an engagement with himself or with God, both disclosed and hidden in his writings. His public life was marked by a series of scandals, including being savagely mocked in a popular magazine, his broken engagement, and his death bed refusal of either the sacrament or a visit from his brother. The Danish public ridiculed and scorned him. In his works, Kierkegaard emerges hidden in pseudonyms, irony, paradox, parody, and satire. The scholar Sylviane Agacinski recognized him to be thoroughly ironic. Louis Mackey observed that "his texts exhibit an almost perfect recalcitrance to interpretation" (1986, p. xxiii), and advanced an understanding that Kierkegaard is a philosophical poet. Others have also noted that Kierkegaard's autobiography and public "lived presence" are part of his indirect communication. Kierkegaard is a master of indirect language. His extremely ironic language and his psycho-philosophico-religious thinking provided the groundwork for post-Hegelian and postmodern philosophy. Kierkegaard's writing continues to sharpen the blade of the cutting edge of philosophy; and the meaning of his writing and his existence is as unsettled as his writing is startling, provocative, and unsettling. His writing calls into question rather than answer questions. He raises the question of death by calling into question our very existence, which is a radically new question in the history of philosophy; a question that has had a profound impact on Western thinking. Danish philosopher Søren Kierkegaard (1813-1855) suffered many hardships that made him question the meanings of life and death, such as the death of his mother and five siblings . Jaspers's psychology is inspired by him; Martin Heidegger's and Jean-Paul Sartre's philosophies borrow basic concepts from him; Dietrich Bonhoeffer's theology is deeply indebted to him. Kierkegaard's work explains man's spiritual flight from mortality and inwardness. He introduces into modernity an awareness of death anxiety as the existential touchstone of religious experience and of philosophical thinking. In Concluding Unscientific Postscripts (1846), the unique, subjective individual exists only in the certainty of his death. Death is the temporal being of existence. Through a "silent understanding of anxiety," which is a philosophical and religious reflection on the subjective certainty of death, Kierkegaard introduces a way of philosophizing that has inspired existentialism and postmodern philosophy. The most astonishing and concealed subjective truth of existence, death, with its infinite responsibility, presents itself in fear and trembling before God's call. 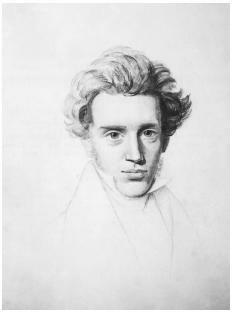 Kierkegaard has greatly influenced the emergence of death as a central question of philosophy, theology, and psychology. Kierkegaard's use of the term faith often pokes fun at and aims at shattering varieties of shallow faith, objectivity, and universality. As a Christian, he vigorously attacks Christian religion that lacks existential faith. Faith is also the paradox he employs against Hegel's philosophical system; that is, the paradox that the individual is higher than the universal. In Fear and Trembling, the paradox is that in taking the leap of faith one regains what has been infinitely resigned as lost. Who so makes the leap of faith is a hero, "knight of faith." Faith is an absolute obedience to God; that is, a "leap of faith" in which obedience to God overrules human love and ethical norms. The irony of the knight of infinite resignation, as the pseudonymous author Johannes de Silentio (Søren Kierkegaard), or John the Silent, does not lead to the resolution of mortality anxiety, which is achieved by the book's hero, the knight of faith. Fear and Trembling centers on an infinitely paradoxical analysis of Abraham, knight of faith, called by God to sacrifice his son. A fool shouts out what de Silentio keeps silent about: "O Abominable man, offscouring of society, what devil possessed thee to want to murder thy son?" The paradox of this pathos is in the terrifying absurdity of Abrahamic faith in God. De Silentio lays out the complex argument of Fear and Trembling, yet, as the reader tries to chase down his paradoxes, de Silentio is, in the manner of his name, infinitely resigned to silence. Kierkegaard is a most extraordinary maker of existential puzzles. The knight of infinite resignation, existentially certain of his death and the loss of the other, no longer believing he will get back what is lost, becomes ironic: He who has not the faith that God gives back what he takes is the knight infinitely resigned. Yet, de Silentio's ironic language gives back and takes away at the same time. Agacinski, Sylviane. Aparté: Conceptions and Deaths of Søren Kierkegaard. Tallahassee: Florida State University, 1988. Kierkegaard, Søren. Papers and Journals: A Selection, translated by Alistair Hanney. Harmondsworth: Penguin Press, 1996. Kierkegaard, Søren. Concluding Unscientific Postscript, translated by Howard V. Hong and Edna H. Hong. Princeton, NJ: Princeton University Press, 1992. Kierkegaard, Søren. The Concept of Irony, with Constant Reference to Socrates, translated by Howard V. Hong and Edna H. Hong. Princeton, NJ: Princeton University Press, 1989. Kierkegaard, Søren. Sickness unto Death, translated by Alistair Hanney. Harmondsworth: Penguin Press, 1989. Kierkegaard, Søren. Either/Or, translated by Howard V. Hong and Edna H. Hong. 2 vols. Princeton, NJ: Princeton University Press, 1987. Kierkegaard, Søren. Fear and Trembling, translated by Alistair Hanney. Harmondsworth: Penguin Press, 1985. Kierkegaard, Søren. The Point of View for My Work As an Author, translated by Walter Lowrie. New York: Harper and Row, 1962. Kierkegaard, Søren. Edifying Discourses, translated by David F. Swensen and Lillian Marvin Swenson. New York: Oxford University Press, 1958. Kierkegaard, Søren. The Journals of Kierkegaard, translated by Alexander Dru. New York: Harper and Brothers, 1958. Kierkegaard, Søren. The Concept of Dread, translated by Walter Lowrie. Princeton, NJ: Princeton University Press, 1957. Kierkegaard, Søren. Repetition, An Essay in Experimental Psychology, translated by Walter Lowrie. New York: Harper and Row, 1941. Lowrie, Walter. A Short Life of Kierkegaard. Princeton, NJ: Princeton University Press, 1942. Mackey, Louis. Points of View: Readings of Kierkegaard. Tallahassee: Florida State University, 1986. Ree, Johnathan, and Jane Chamberlain. Kierkegaard: A Critical Reader. Oxford: Blackwell Publishers, 1998.